Why should Wall Street complain when a company is doing well? Emme Kozloff, an analyst at Sanford C. Bernstein & Company, faulted Mr. Sinegal as being too generous to employees, noting that when analysts complained that Costco's workers were paying just 4 percent toward their health costs, he raised that percentage only to 8 percent, when the retail average is 25 percent. "On Wall Street, they're in the business of making money between now and next Thursday"
One analyst, Bill Dreher of Deutsche Bank, complained last year that at Costco "it's better to be an employee or a customer than a shareholder." The Moirae (Fates), originally uploaded by ibanda. 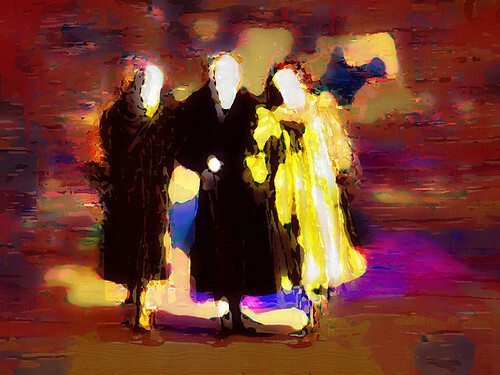 One of my own images this time, developed out of a photograph of three inoffensive old ladies in fur coats! Quoted on Ken MacLeod's blog - The Early Days of a Better Nation. To understand is not to forgive. It is simply better than the alternative, which is not to understand. Soething which should probably be e-mailed every day to some inhabitants of Blogistan until they finally get the bloody point! I've added a new (to me) link to the Politics blog roll (via Kevin Carson) - The Uncapitalist Journal. It looks like an interesting one to follow. within the fabric of then or later, originally uploaded by mseidman. If you have problems seeing any of the pictures blogged from Flickr thsi is because they are haveing some problems. It should on past practice be sorted soon. My reader may not have noticed, but I have made some changes to the blog roll under the politics heading. I don't pretend to have an exhaustive list of sites, limiting myself to those which are a 'good read' and have something interesting to say. Of course things change so I've done a bit of updating. I've deleted the Adam Smith Institute blog. It turns out the link was broken anyway, but by and large it has deteriorated into vanity publishing for a group of pompous windbags and despite its pretense at allowing comments it is, as many others have pointed out, notorious for only allowing its supportersa voice. I've also deleted Samizdata. That was much harder. When I first discovered blogging, Samizdata was a breath of fresh air. I was never happy with their comparison with the underground publishers of teh Soviet Union - after all you can't get much more open than the Web - but generally the posts were thought provoking and the discussion stimulating. Good examples for example were its promotion of private sector approaches to space exploration. I'm not going to link explicitly to this - if you want a feel just read the discussion on anything to do with the recent terrorism in London. I'm not sure why this change has happened. I've commented on it already a couple of times, but it has reached such nauseating levels that I don't think I can link anymore. What is disturbing is that the main posts never seem to descend to these levels but the posters nevertheless seem happy to allow it to happen. dedicated to John Ashcroft and the Patriot Act, originally uploaded by btezra. all day long, originally uploaded by mseidman. For those ignorant and arrogant people who insist on treating Islam as indivisible read this. Islam strictly, strongly and severely condemns the use of violence and the destruction of innocent lives. There is neither place nor justification in Islam for extremism, fanaticism or terrorism. Suicide bombings, which killed and injured innocent people in London, are haram - vehemently prohibited in Islam, and those who committed these barbaric acts in London are criminals not martyrs.